Have you noted the history of Moses? (20:9). When he saw a fire, he said to his family, “Stay here. I have seen a fire. Maybe I can bring something therefrom or find some guidance at the fire.” (20:10). When he came to it, he was called, “O, Moses (20:11). I am your Lord; take off your sandals. You are in the sacred valley of Tuwa (20:12). I have chosen you, so listen to what is being revealed (20:13). I am God; there is no other god beside Me. You shall worship Me alone, and observe the Contact Prayers (Salat) to remember Me (20:14). The Hour is surely coming; I will keep it almost hidden, for each soul must be paid for its works (20:15). Do not be diverted from it by those who do not believe in it – those who pursue their own opinions – lest you fall (20:16). Note: When Moses was at the appointment God let him know that there is no other god besides Him and he must observe Salat to remember Him being certain about the Hour, i.e., the End of the World. “What is in your right hand, O Moses?” (20:17). He said, “This is my staff. I lean on it, herd my sheep with it, and I use it for other purposes.” (20:18). He said, “Throw it down, O’ Moses.” (20:19). He threw it down, whereupon it turned into a moving serpent (20:20). He said, “Pick it up; do not be afraid. We will return it to its original state (20:21). And place your hand under your arm; it will come out white without a blemish; another proof (20:22). We thus show you some of our great signs.” (20:23). Note: God showed him two great signs of his Lord. “Go to Pharaoh, for he has transgressed.” (20:24). He said, “My Lord, expand my breast for me (20:25). And make my task easy for me (20:26). And untie a knot from my tongue (20:27). So they can understand my speech (20:28). And appoint an assistant for me from my family (20:29). Aaron, my brother (20:30). Strengthen me with him (20:31). Let him be my partner in this task (20:32). That we may glorify You enough (20:33). And commemorate You enough (20:34). You are Seer of us.” (20:35). He said, “Your request is granted, O Moses (20:36). Note: Moses made several requests to God to face Pharaoh and his requests were granted including Aaron being chosen as prophet to assist him. “We have blessed you another time (20:37). When we revealed to your mother what we revealed (20:38). That `Put him into the box, then throw him into the river. The river will throw him onto the shore, to be picked up by an enemy of Mine and an enemy of his.’ I showered you with love from Me, and that you shall be raised under My eye (20:39). Your sister walked to them and said, `I can tell you about a nursing mother who can take good care of him.’ We thus returned you to your mother, that she may be happy and stop worrying. And when you killed a person, we saved you from the grievous consequences; indeed we tested you thoroughly. You stayed years with the people of Midyan, and now you have come back in accordance with a precise plan, O Moses (20:40). Note: God also let him know how he had been saved from Pharaoh and returned to his mother. I have chosen you for Myself.” (20:41). “Go, you and your brother with My signs, and do not waver in remembering Me (20:42). Go, both of you to Pharaoh, indeed, he has transgressed (20:43). Speak to him nicely; he may take heed, or become reverent.” (20:44). They said, “Our Lord, we fear lest he may attack us, or transgress.” (20:45). He said, “Do not be afraid, for I will be with you, listening and watching (20:46). Go to him and say, `We are two messengers from your Lord. Let the Children of Israel go with us. You must refrain from persecuting them. We bring a sign from your Lord, and peace be upon those who follow the guidance (20:47). We have been inspired that the retribution will inevitably afflict those who deny and turn away.’ ” (20:48). He said, “Who is your Lord for both, O Moses.” (20:49). He said, “Our Lord is the One who gave everything to its form, and then guided.” (20:50). He said, “What about the past generations?” (20:51). He said, “Its knowledge is with my Lord in a record. My Lord does not err or forget.” (20:52). Note: God asked him to go to Pharaoh with His signs and let him know how to speak with Pharaoh. He also ensured him to be with him to strengthen him on the spot. In fact, everything is spelled out what need to be done and what need to be said when both Moses and Aaron will meet Pharaoh. “What has made you to hasten from your people, O Moses?” (20:83). He said, “They are my close associates. I have hastened to You my Lord, that You may be pleased (20:84). He said, “We have put your people to the test after you left, but the Samarian misled them.” (20:85). Note: God informed Moses that He tested his people in his absence and Samarian misled them. Moses returned to his people being angry and disappointed. He said, “O my people, did your Lord not promise you a fair promise? Did the promise seem to you too long? Or did you desire that wrath should descend upon you from your Lord and that you broke your promise with me?” (20:86). They said, “We did not break the promise to you on our will. But we were loaded down with the jewelry of the people, so we threw them down and this is what the Samarian suggested.” (20:87). He made for them a calf that emitted sound. Then they said, “This is your god, and the god of Moses, but he had forgotten.” (20:88). Did they not see that it neither responded to them, nor possessed any power to harm them, or benefit them? (20:89). And Aaron had told them, “O my people, you are being tested with it. Your only Lord is the Most Gracious. So follow me and obey my command.” (20:90). They said, “We will remain devoted to it until Moses comes back to us.” (20:91). Note: Moses angrily returned to his people and asked them why did they break the fair promise of God? His people replied that they did not do that on their own, what they did, did that according to Samarian’s suggestion. He said, “O Aaron, what prevented you, when you saw them going astray (20:92). Do you not follow me? or have you disobeyed my command?” (20:93). He said, “O son of my mother; do not grab me by my beard nor my head. I feared that you would say, `You have divided the Children of Israel, and have not followed my order.’ ”(20:94). Note: Moses also got mad on his brother and accused him for the situation. He said, “What is the matter with you, O Samarian?” (20:95). He said, “I saw what they did not see. I grabbed a fistful from where the messenger was standing and threw it. This is what my mind inspired me to do.” (20:96). He said, “Then go, for you in this life, you will say, “I am not to be touched”. But you will have an appointed time that you can never evade. Look at your god that you remain devoted to, we will burn it and scatter its particles into the sea.” (20:97). Your only god is God, the One; there is no other god except He. His knowledge encompasses all things (20:98). Note: Moses also got mad on Samarian for his such evil behavior and let him know that he was going to destroy the statue and throw its parts into the sea confirming him that our god is God who encompasses all things. Once Moses said to his family (his brethren), “I see a fire, let me bring news for you therefrom or a torch of light so that you may guide yourselves” (27:7). Then when he came to it, he was called: “Blessed is the One who is at the fire, and the one who is around it. Glory be to God, Lord of the universe” (27:8). “O Moses, I am God, the Almighty, Most Wise (27:9), throw down your staff”. When he saw it moving like a demon, he turned around and fled. “O Moses, do not be afraid. My messengers shall not fear (27:10), except those who commit a transgression, even then substitute righteousness after sinning; I am Forgiving, Most Merciful (27:11), put your hand in your pocket; it will come out white, without a blemish”. These are among nine miracles to Pharaoh and his people, for they are wicked people (27:12). Note: The conversion is repeated confirming nine miracles to Moses to deal with Pharaoh and his people. We summoned Moses for thirty nights, and completed them by adding ten. Thus, the audience with his Lord lasted forty nights. Moses said to his brother Aaron, “Stay here with my people, maintain righteousness, and do not follow the ways of the corruptors.” (7:142). When Moses came at our appointment, and his Lord spoke with him, he said, “My Lord, let me look upon You.” He said, “You cannot see Me. Look at the mountain; if it stays in its place, then you can see Me.” Then, his Lord manifested Himself to the mountain, and He made it to crumble. Moses fell unconscious. When he returned to normal, he said, “Glory be to You. I repent to You, and I am the first of those who believe.” (7:143). Note: The initial thirty nights appointment was increased by ten. When Moses came to his appointment he wanted to see God but He let him know that you could not see Me and gave him a sign. When God manifested Himself on the mountain, the mountain crumbled. Moses became unconscious, and he repented to God when he recovered. He said, “O Moses, I have chosen you, over all the people with My messages and by speaking to you. Therefore, take what I have given you and be appreciative.” (7:144). We wrote for him on the tablets all kinds of enlightenments and details of everything: “You shall uphold these teachings strongly, and exhort your people to uphold them – these are the best teachings. I will show you the abode of the wicked.” (7:145). I will turn them away from My revelations who are arrogant on earth, without justification, even if they see every sign they will not believe in it. And when they see the path of guidance they will not adopt it as their path, but when they see the path of straying they will adopt it as their path. This is because they denied our revelations as well as they were heedless to them (7:146). Those who denied our revelations and the meeting of the Hereafter, their works are nullified. Shall they be rewarded except for what they have done? (7:147). Note: Moses was selected for His messages and was given tablets. He was asked to uphold His teachings and exhort his people to do the same with a warning that anyone who denied His revelations and the meeting of the Hereafter, his all works will be nullified. The people of Moses in his absence made from their ornaments the statue of a calf, which had a sound. Did they not see that it could not speak to them, or guide them in any path? They worshiped it and turned wicked (7:148). When they felt remorse for what they had done and found that they had gone astray, they said, “Unless our Lord have His mercy on us and forgive us, we will be losers.” (7:149). Note: In the absence of Moses, his people made the statue of a cow and worshiped it but when they realized that they had gone astray, they repented and apologized to God. When Moses returned to his people, angry and disappointed, he said, “What a terrible thing you have done in my absence! Could you not wait for the commandments of your Lord?” He threw down the tablets, and took hold of his brother’s head, pulling him towards himself. He (Aaron) said, “Son of my mother, the people took advantage of my weakness, and almost killed me. Let not my enemies rejoice, and do not count me with the transgressing people.” (7:150). He (Moses) said, “My Lord, forgive me and my brother, and admit us into Your mercy. Of all the merciful ones, You are the Most Merciful.” (7:151). Surely, those who worshiped the calf have incurred wrath from their Lord, and humiliation in this life. We thus requite the innovators (7:152). And those who committed sins, then repented thereafter and believed, your Lord – after this – is Forgiver, Most Merciful (7:153). When Moses’ anger subsided, he picked up the tablets, containing guidance and mercy for those who are reverent to their Lord (7:154). Then Moses selected seventy men from his people, to come to our appointment. When the quake shook them, he said, “My Lord, You could have annihilated them in the past, together with me, if You so willed. Would You annihilate us for the deeds of those among us who are foolish? This must be the test that You have instituted for us. With it, You condemn whomever You will, and guide whomever You will. You are our Lord and Master, so forgive us, shower us with Your mercy; You are the best Forgiver” (7:155). Note: When Moses returned to his people, he was so angry that he threw down the tablets and took hold of his brother’s head pulling him towards himself but he apologized to God to have mercy on him as well as his brother. Then he selected seventy men from his people and came to the appointment. The quake shook them and Moses prayed to God that You are our Lord and Master, so forgive us and shower us with Your mercy, You are the best Forgiver. We called him (Moses) from the right side of the Mount and we brought him close to talk (19:52). And we granted him, out of our mercy, his brother Aaron as a prophet (19:53). Note: Moses’ request was fulfilled by appointing Aaron as a prophet to strengthen him. When we summoned Moses for forty nights, you worshiped the calf in his absence and turned wicked (2:51). Then we forgave you thereafter so that you may be appreciative (2:52). And we gave Moses the scripture and the statute book, that you would be guided (2:53). Moses said to his people, “O my people, you have wronged your souls by worshiping the calf. You must repent to your Creator. You shall kill your egos. This is better for you in the sight of your Creator and He will forgive you. He is the Redeemer, the Most Merciful.” (2:54). And you said, “O Moses, we will not believe you unless we see God, physically.” So, the lightning struck you while you were still looking (2:55). Then we revived you after you had died, so that you may be appreciative (2:56). Note: What we see in the above verses is the summary of the conversation at the very beginning of our guidance. During the forty nights appointment, the people of Moses worshiped the calf and turned wicked. The scripture given to Moses would only guide to the straight path and can only return to the path of God through repentance when they turn wicked. When he had fulfilled his obligation, he traveled with his family. He saw from the slope of the Mount a fire. He said to his family, “Stay here. I have seen a fire. Maybe I can bring to you news from there, or a portion of the fire to warm you.” (28:29). When he reached it, he was called from the edge of the right side of the valley on the blessed ground from the tree (a specific location): “O Moses, it is Me. God; Lord of the universe (28:30). “Throw down your staff.” When he saw it moving like a demon, he turned around to flee and did not return. “O Moses, come back; do not be afraid. You are perfectly safe (28:31). “Put your hand into your pocket; it will come out white without a blemish. Fold your wings and settle down from your fear. These are two proofs from your Lord, to Pharaoh and his elders; they are wicked people.” (28:32). He said, “My Lord, I killed one of them, and I fear lest they kill me (28:33). And my brother Aaron is more eloquent than I. Send him with me to help and to strengthen me. I fear that they will deny me.” (28:34). He said, “We will strengthen you with your brother, and we will provide you both with manifest authority. Thus, they will not be able to touch either one of you. With our miracles, the two of you, together with those who follow you, will be the victors.” (28:35). Note: The conversation is repeated in this sura so that we can reflect on the event from the historical perspective as well. You were not present on the slope of the western mount, when we decreed the command to Moses; you were not a witness (28:44). But we established many generations, and a long period of time had passed, You were not among the people of Midyan, reciting our revelations to them. But we did send messengers (28:45). Nor were you on the slope of the Mount when we called. But it is mercy from your Lord in order to warn people who received no warner before you, that they may take heed (28:46). Note: There is a beginning and an ending of the history of the event along with explicit description and repetition in between. The use of singular second person both in the beginning and in the ending of the history of the event indicates that the prophet who delivered the Quran has been addressed and thus, the history came down to the later generations of people. However, the conversation has ended to let us know that it was a God’s mercy so that people can take heed. The event of Mount Sinai is detailed out in 98 verses of the Quran across 6 suras prefixed with the Quranic initials. 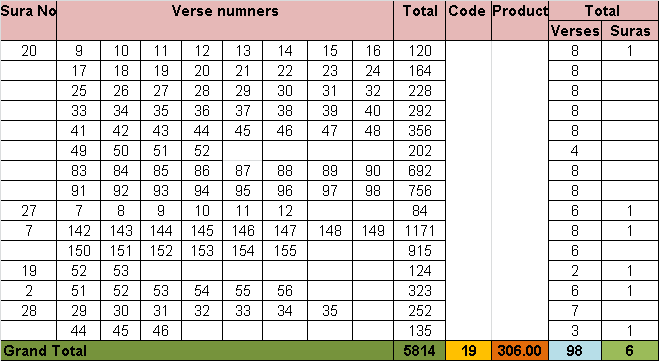 If the relevant sura # and verse # of all these references are added, the sum is a multiple of 19 => 5814 = 19 x 306 (See Table below for details). Note: There is also mention of addressing children of Israel on the right side of the Mount in (20:80), which is excluded from the mathematical calculation not to be directly connected to the event of Mount Sinai but one of the favors bestowed upon them. [20:80] O Children of Israel, we delivered you from your enemy, we addressed you on the right side of the Mount, and we sent down to you manna and quails. The sum of the numbers mentioned in relation to the appointment time is also multiple of 19 => 30 +10 + 40 (7:142) + 70 (7:155) + 40 (2:51) = 190 = 19 x 10 as the numbers mentioned in the Quran play a significant role in the numerical structure of the Quran. If the relevant sura and verse # are added where these numbers are mentioned, the total is 40 [ (7 + 1 + 4 + 2) + (7 + 1 + 5 + 5) + (2 + 5 +1) = 14 + 18 + 8 = 40] which also confirms the forty nights appointment time. Without repetition of messenger number the sum of the numbers mentioned in relation to giving of great signs of God to face Pharaoh is a multiple of 19 if the total number of sura, which is 6, is added to the sum => 2 (signs) in 28:32 + 2 (messengers) in 28:35 + 2 (messengers) in 20:47 + 9 (miracles) in 27:12 => 2 + 2 + 2 + 9 => 2 + 2 + 9 = 13 => 13 + 6 = 19 = 19x1. This 4-fold mathematical proof confirms that this is not only the most unusual event but also in it there is significant lesson for us. The Biblical words (Hebrew), “Har Sinai” and “Har Horeb” while the Quranic words (Arabic), “Al-Toor” and “Toorin Sinin” refer to the Mount Sinai where God spoke to Moses. God has preserved the event but not the geographical position of the sacred site as we do not see any conclusive identification of it while there is mention of it in the Quran in the valley of Tuwa. The early Jewish pilgrimages had identified Jebel Musa as Mount Sinai in the southern Sinai peninsula (now in Egypt). But many scholars and archeologists believe that the true Mount Sinai is not in the southern Sinai peninsula as the criteria stated in the Bible do not match to the site. Now scholars have proposed 13 sites outside of the Sinai peninsula to be the true Mount Sinai including Har Yaroham in the southern Negev of Israel and four sites in Midian in northwest Arabia on the east shore of the Gulf of Aqaba. However, there is no existence of the Mount as it crumbled when God manifested Himself on it to show His presence to Moses as well as to directly speak to him and gave him ten commandments. Even the site is sacred but Its exact geographical position is not known to us as of today. We may know its exact location when God so wills. But what is important to understand that it is God’s mercy that He has not decreed any rituals related to the site while the event has a special importance to us if we can reflect to its teachings realizing that God came down to the earth to confirm certain matters. There is no doubt that the event of Mount Sinai is the most unusual event and its history is covered in the 6 initialed suras, which has 4-fold mathematical confirmation as well. The key teachings that we find in the conversation are: (1) our shahadah, the 1st commandment for all generations of people – there is no other god besides God to leave any room to corrupt it by adding anyone name to it such as Muhammad, Ali etc., (2) our salat existed even before the time of Moses and there is a hint what should be the correct way to observe it without praising anyone during the prayer while there is no support for the notion of starting of Salat at the time of Muhammad or his back and forth journey to God for negotiating of 5 times prayers from 50 times prayers a day, (3) certainty about the End of the World while many of us are not sure about the End of the Word or the Hereafter, (4) the statements like “I have chosen you for Myself and I have chosen you, over all the people with My messages and by speaking to you” confirm that God has no preference over any of His prophets and messengers except they are chosen for a specific purpose for the particular generation of people, (5) throwing down of tablets by Moses indicates that the paper and ink should not have any importance but the commandments in it while many of us ignore many commandments of the Quran but demonstrate their extreme respect to the paper and ink comprising the Quran as well as putting it in a higher shelf, (6) when the people of Moses had gone astray, they repented to God for their wrongdoing and asked Him for His mercy and forgiveness without involving Moses while many of us involve Muhammad in their every praise and prayer violating the 1st commandment and (7) the breaking down of the high mount serves as a physical evidence to understand one of the events on the Day of Resurrection how the high mountains will crumble into pieces. However, we may advance believing and accepting the truth regarding the matter upon verification or we may stay behind due to our doubt and disbelief.